You finally decided that you need a website but before you go into detail about how your website should look, what colors should you use and what to use it for exactly, you need two things without which you can’t move forward. A domain name is web address like colormelon.com that people will type in their browser to get to your website. Web hosting is a service that provides access to your website and stores all your files. You can think about web hosting as a kind of office space that you’re renting – but instead of an actual place in a building, it’s on the web. A web hosting service will make sure that your website shows up on the Internet, loads properly and doesn’t go down. All hosting providers will cost you something and as with most things, the more you pay the better quality service you get. The typical price of a hosting service is somewhere between $3 – $7/mo. Although $3 -$7 a month is equivalent to the price you would pay for a cup of coffee or two, be aware that you get this price only if you pay for a year in advance. If you want to pay on a monthly basis the price will be higher. That’s just how it works, hosting providers want you to pay for a year in advance. Even if they didn’t require year-in-advance payments – when you choose a hosting provider, you probably will want to stick with them because migrating from one hosting provider to another is quite time-consuming. So web hosting will cost you somewhere around $35 – $60 a year. A domain name will cost you around $10 – $15 a year. Then there’s the Website Platform – we specialize in and strongly suggest WordPress – it’s easy to master, powerful, well supported and FREE. There are a lot of hosting providers out there – maybe you’ve heard names like GoDaddy, BlueHost, HostGator. These three are advertised a lot, but we really suggest that you stay away from these. We’re not going into detail about why we think these hosting providers are awful (even though many people suggest choosing them), but if you’re curious – check out our rant here. We recommend SiteGround because it’s the best bang for your buck, based on our own experience and on rigorous performance tests done by ReviewSignal. SiteGround is easy to manage, straight forward, and very affordable at $3.95/mo (+ domain name, if you don’t have one yet)! Disclaimer: The above banner is an affiliate link – meaning that you will pay the regular price for the hosting but SiteGround will give us a commission. So if you decide to use SiteGround, thanks! If you click on the “Web Hosting” banner above, you will be lead to SiteGround hosting plans and pricing. Choose the StartUp plan and click on the “Get Started” button. Next, you need to set up your domain name. If you already have a domain name purchased, choose the “I already have a Domain” option and follow the instructions on the site. If you don’t have a domain name, we suggest that you purchase one right there through SiteGround. The cheapest option online that you can get for a .com domain is about $11/year. 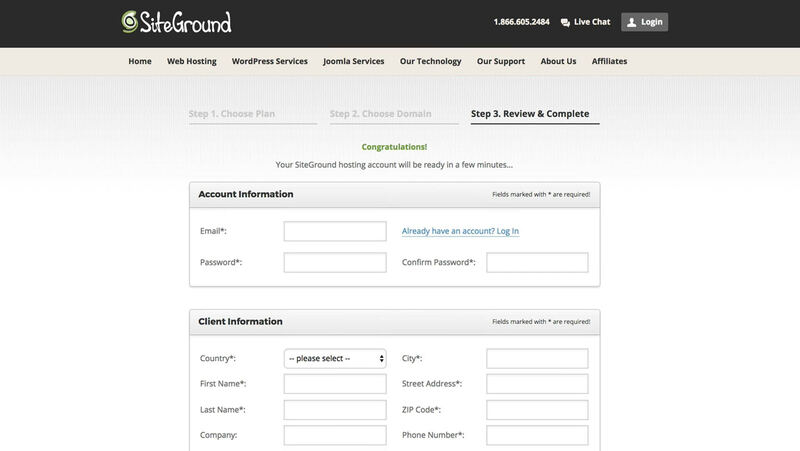 SiteGround sells domain names for $15/year. It’s a $4 difference but it will save you a lot of time, so if you can, consider spending just $4 more for your convenience. Your domain name must be unique, so if you choose a name that’s already taken, the website will warn you and give you a couple of alternative options for the name. Try a couple of name variations until you find one that is unique, memorable and easy to pronounce. Now it’s time to fill out a couple of forms in order to create your SiteGround account, add your payment information and other classic registration details. Fill out all the required (marked with *) fields. 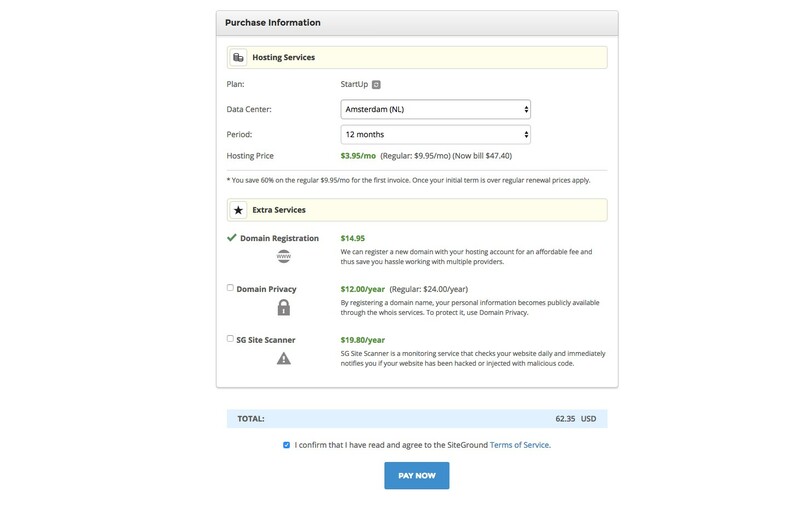 Pay extra attention to the Data Center field in the “Purchase Information” area. Click on the little refresh icon and choose a location that is closest to your business location. So if you’re in the USA you would choose “Chicago (USA)”, if you’re from Hamburg, Germany – the closest data center would be “Amsterdam (NL)” and so on. The last part of the form consists of Extra Services that the hosting company provides. All you need is “Domain Registration” (if you didn’t have your own already), so uncheck the rest of them. Your total price may vary depending on your currency, your countries VAT and whether you chose the 1-month period fee or 1, 2 or 3-year fee. 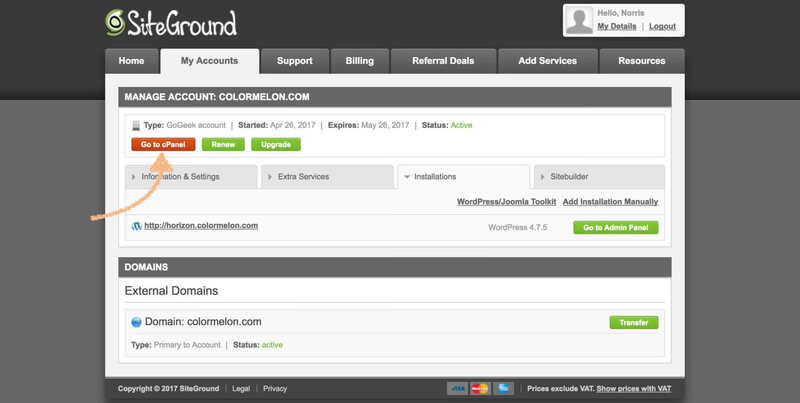 When your hosting has been paid for, it’s time to install WordPress so that you can start building your website. 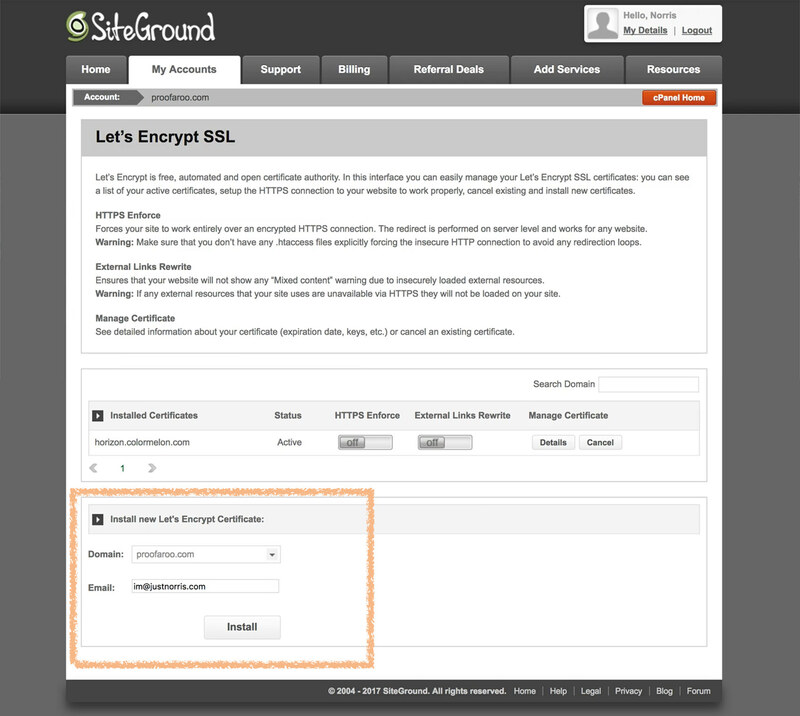 Check your email for confirmation and then log in to your SiteGround.com account. Go to “My Account” and click on the “Go to cPanel” button. cPanel stands for Control Panel and although there are a lot of icons there, you will have to deal with only two of them, so don’t worry! SSL stands for Secure Sockets Layer and it’s a security protocol that ensures that your that all sensitive information on the site (payment details, contact details) are encrypted and protected. 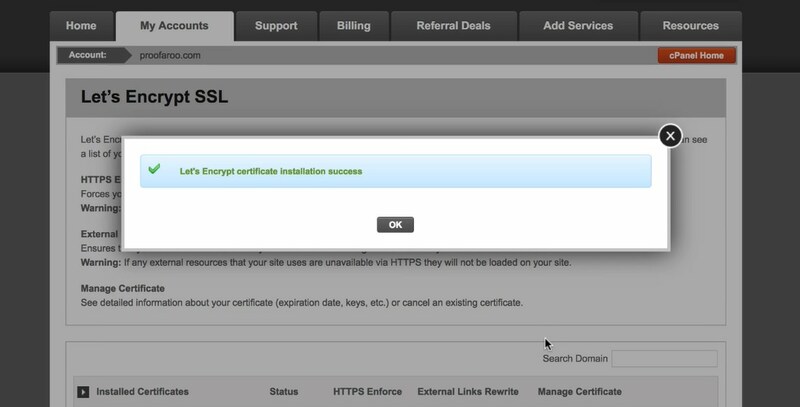 If you want to know more about SSL and why it’s important, watch this 2 min video. On top of that, big companies like Google are pushing for widespread SSL adoption – so if you don’t want to be left behind by Google – I highly recommend using SSL. There are no downsides, only upsides! Let’s make your website safe! First, scroll down and locate “Let’s Encrypt” icon. To generate an SSL certificate for your website all you need to do is make sure your domain name is correct, enter your email address and click the “Install” button. It will start the installation process that takes about 20 – 40 seconds to complete. You should get a success message when the installation is complete. Now your future website will have a little green padlock icon next to the browser bar that will let your website visitors know that your site is safe to browse! 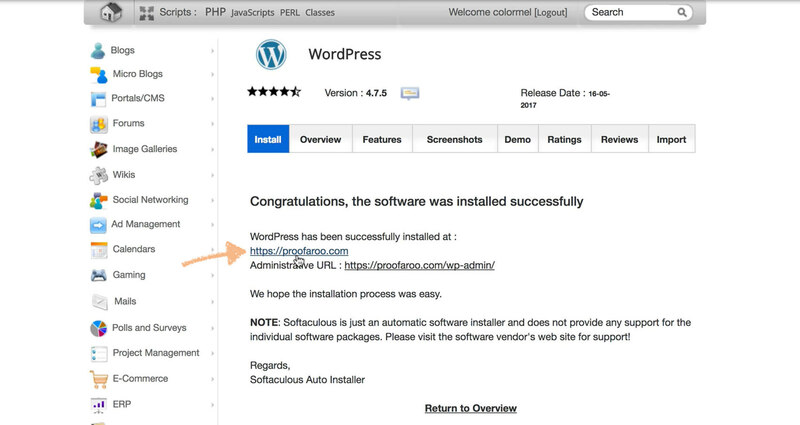 Go back to your cPanel and now locate “WordPress Installer” and click on it. You will be led to a new page. Locate the “Install Now” link to get to the installation section. In the Admin Account area, create a username and password for yourself. You will use it when logging onto your website so make sure it’s a strong, secure password! 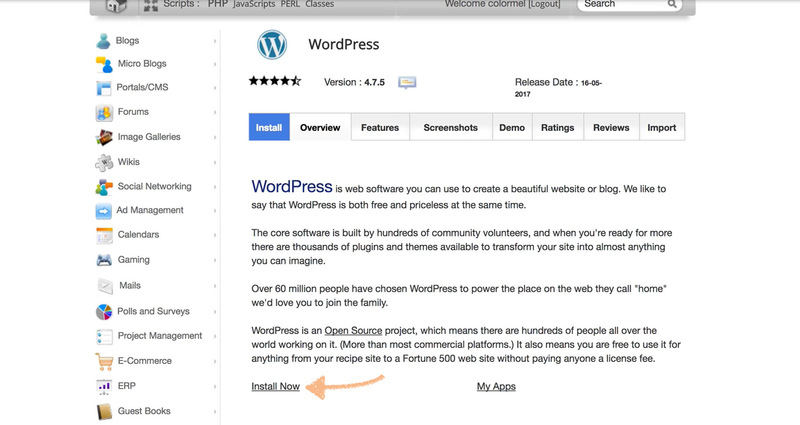 Finally, click “Install” and wait for your WordPress to finish installing. 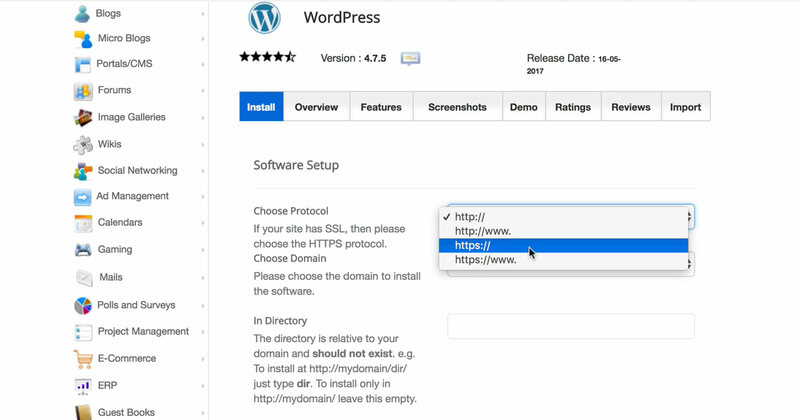 You just set up your web hosting and installed WordPress onto your site all by yourself! Click on your website address link to see your site live. 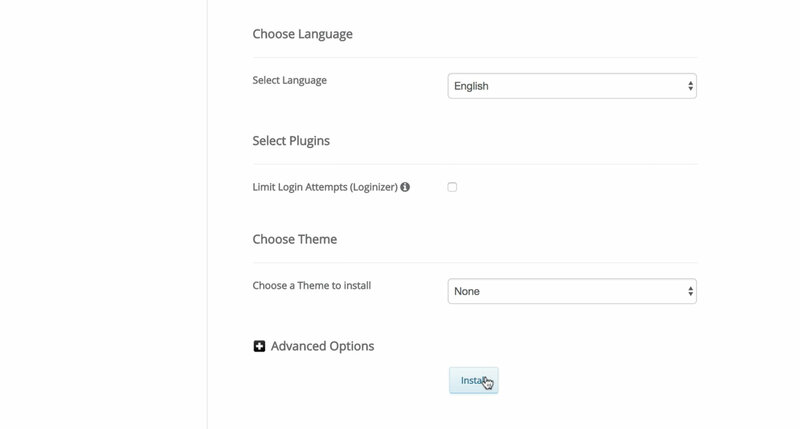 To get to your WordPress dashboard just type /wp-admin at the end of your website address. In my case, I would need to go to proofaroo.com/wp-admin There you will need to enter the username and password you created in the previous step. Now that you have your hosting and domain set up and ready, it’s time to create your own personal website. If you’re looking for a way to create a free portfolio website, check out our step-by-step guide on how to Make a Free Portfolio Website with WordPress. And if you’re looking to take your new website design one step forward, check out our custom made, premium WordPress themes!